The sequel to last year's KeyOne, this is a mid-range Android smartphone with a physical keyboard and is the first BlackBerry smartphone with a dual camera. 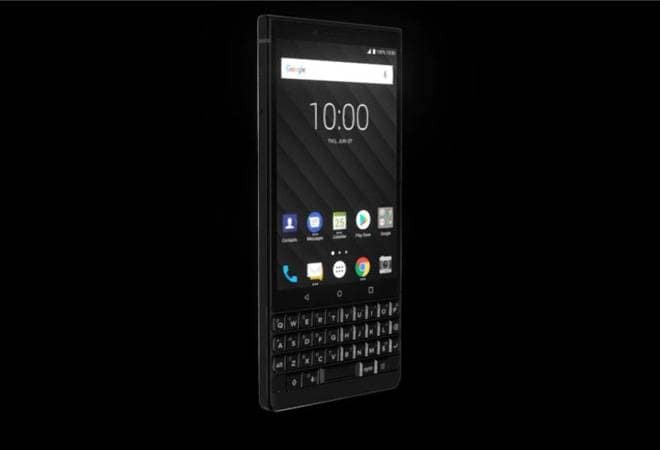 TCL Communications, the global licensee brand for BlackBerry Mobile, just unveiled its latest smartphone - KEY2 - with a design that stands out. The sequel to last year's KeyOne, this is a mid-range Android smartphone with a physical keyboard and is the first BlackBerry smartphone with a dual camera. "BlackBerry phones are the world's most secure Android smartphones. We design them for security from the inside out. BlackBerry has been iterating and perfecting our approach to mobile security for decades, and we're excited to have this new genuine, modern BlackBerry smartphone available for our fans around the world to enjoy," said Alex Thurber, SVP and GM of Mobility Solutions at BlackBerry. "Crafted using the Series 7 aluminium frame for added durability, it has a diamond pattern soft touch back. BlackBerry KEY2 has a redesigned intelligent keyboard along with a 4.5-inch touch display with 1620 x 1080 IPS LCD protected by 2.5D Corning Gorilla Glass. Running on Android 8.1 Oreo operating system, it comes with a Speed Key, a universal shortcut key for accessing apps, contacts and most commonly used functions instantly. The height of the physical keyboard is said to be increased by 20 per cent for accurate typing experience. The KEY2 runs on Qualcomm Snapdragon 660 processor with 6GB RAM, and is available in two variants - 64GB and 128 GB internal storage - with expandable storage of up to 256GB. It packs in a 3500mAh battery, supports QC 3.0 chargers and claims to offer 2-day battery backup. Being the first dual camera from the BlackBerry stable, the Key2 packs in two 12-megapixel cameras, with one having aperture f/1.8 and the other aperture f/2.6 for faster autofocus and Portrait Mode. It also features an 8-megapixel front camera with fixed focus, selfie flash using LCD. Focusing on security, KEY2 includes BlackBerry's proprietary technique for establishing a hardware root of trust by adding security keys to the processor. It comes preloaded with DTEK by BlackBerry application with 'at a glance' security meter, which shows the overall security rating of the device and gives access to application permissions management. It also includes the new proactive health check feature, which enables the user to scan the device and receive instant feedback on the potential vulnerabilities and security optimizations. Locker feature has been improved to offer even greater personal privacy and control over the content. It includes features like private folders for documents and photos and Firefox Focus, the privacy browser by Mozilla. This pre-loaded privacy application can only be accessed with the fingerprint or password, helping store and protect sensitive user data, apps and content such as photos and downloaded files. BlackBerry KEY2 also supports Android zero-touch enrolment, making it seamless for large organizations to deploy and manage their corporate-owned mobile devices. "Although there are many different smartphones available for consumers today, most tend to offer very similar experiences without much distinction from one to the next," said Alain Lejeune, Senior Vice President, TCL Communication & President, BlackBerry Mobile. "With the introduction of BlackBerry KEY2, we've created a distinct smartphone that captures all the traits that have made BlackBerry smartphones iconic, while introducing new innovations and experiences that not only make this one of the best devices for security and privacy, but also the most advanced BlackBerry smartphone ever."